Manoj Night Shyamalan, alias Manoj Nelliyattu Shyamalan, director, screenwriter and actor was born on 6th August 1970 in Pondicherry. His parents Nelliyate C Shyamalan and Jayalakshmi were both doctors and the family moved to the United States when Shyamalan was still a young boy and he was raised in a suburban area of Penn Valley of Philadelphia. He had his early education at a Catholic Private School and Philadelphia's Episcopal Academy. 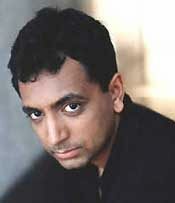 Although he received scholarships to several medical schools, Shyamalan chose to attend the Tisch School of Arts at New York University to study film-making. Shyamalan had a very early passion for filmmaking and as a child, he revelled in making up stories. At the age of 10, inspired primarily by Steven Spielberg's films, he began making film with his father's 8mm camera and by age 16, he had made over 45 short films. Shyamalan graduated from NYU and during his final year, he wrote, directed and starred in his first full-length feature film, 'Praying With Anger'. In 1995 he was asked to write the script for a combined live action-animated version of the E B White children's classic 'Stuart Little' and it was released onto the big screen in 1999. In 1997 he made his second film 'Wide Awake'. Shyamalan's third directorial effort , the supernatural thriller 'The Sixth Sense' in 1999, was one of the year's biggest box office hit. It scored six Academy Award nominations, including one for Best Picture and two for Shyamalan himself for Best Director and Best Original Screenplay. This film about a 11 year old disturbed boy who can see the dead, has also won two Golden Globe nominations and 26th annual People's Choice Award for the favorite dramatic film. Following the success of the this film he directed another supernatural thriller 'Unbreakable' in 2000'. This film about a man who undergoes mysterious changes following a train accident. In 2002, Shyamalan directed another film 'Signs' an emotional story which deals with crop circles in a rural Pennsylvania town. In 2003 Shymalan comes the chilling tale of a close-knit community that lives with the frightening knowledge that creatures reside in the woods around, and the courage of one young man who challenges the unknown creatures in the film 'The village'. Now Shyamalan is working on a new project called The Life Of Pi which will be shot in Pondicherry, India, his birth place. Shyamalan, now living in Philadelphia with his wife Bhavana and their daughter Selitha has become the most recognised Indian name in Hollywood with his phenomenal success.